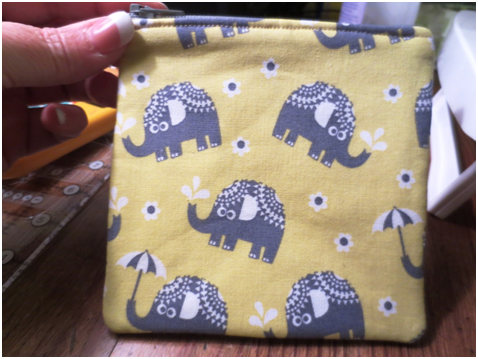 How to make a zippered pouch. 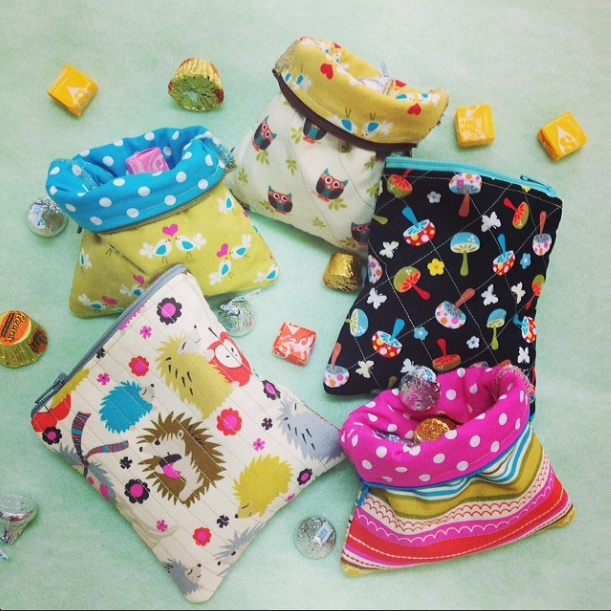 We absolutely love the zippered pouches that Jennifer made for each of us! 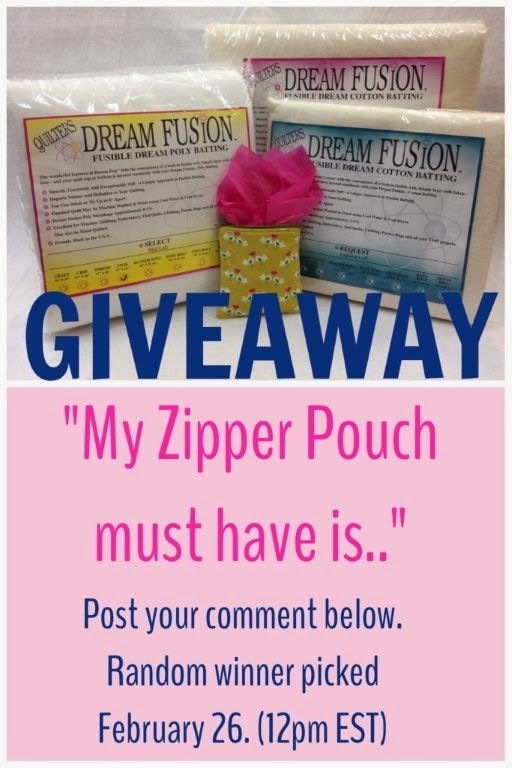 In fact, we love them so much, we want to share - Jennifer has made a zippered pouch that we are giving away, with added Dream Fusion Batting that you can use for your own fun projects! Yes, it is that easy!!! 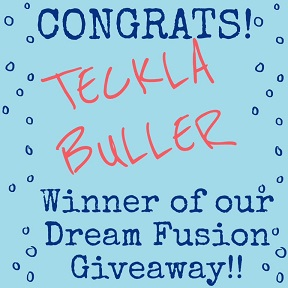 Just post your comment at the end of this blog to be entered to win! 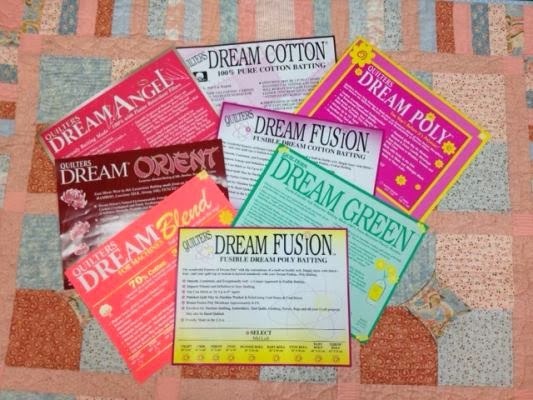 Place your Quilters Dream Fusion batting right side up on your ironing surface and your outer pouch fabric right side up on top of the Dream Fusion Batting. 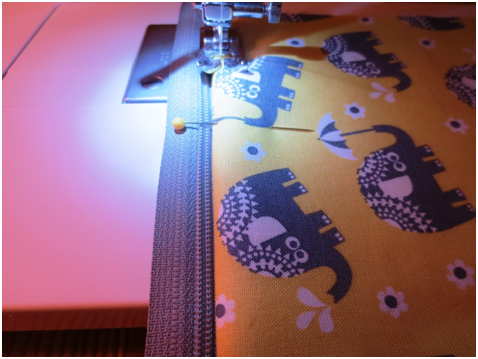 We mark the fusible side with a sticker, but if you have a scrap piece without a sticker, place the piece of Dream Fusion under a light and you will be able to see the fusible needled punched fibers as they will shine under the light. Iron the fabric and batting to fuse them together. (Don't you love this cute little iron!!!) It is suggested to use a steam iron on the fabric setting you are using, but as you can see, I used my mini iron and it fused nicely. 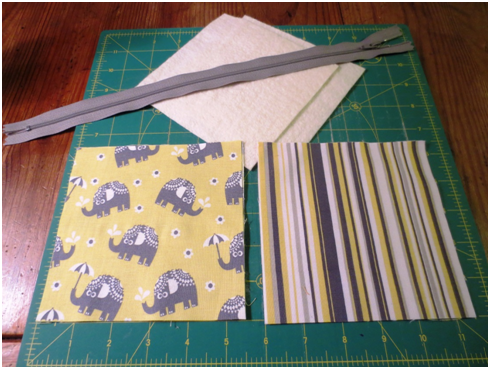 You now have two outer pieces of fabric fused to Dream Fusion batting and two pieces of coordinating lining fabric for your pouch. 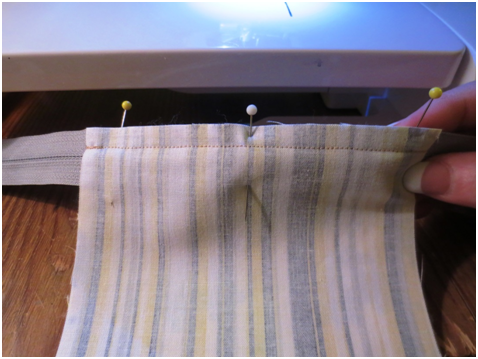 Take your zipper and place it right side down on the top edge of your outer fabric. Pin to your liking. 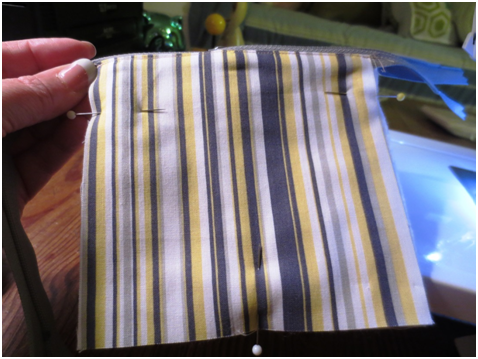 Take your lining fabric and place it right side down on top of your zipper, lining up the edges with your outer fabric piece. Pin to your liking. The zipper will be sandwiched in between the fabric. You will now sew the three layers together, sewing as close to the zipper teeth (or chain) as possible. 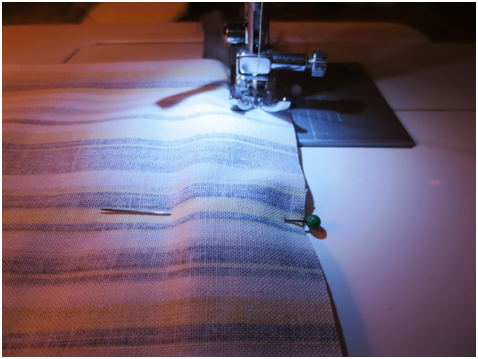 Depending on your sewing machine the seam will be a little larger than a quarter of an inch. 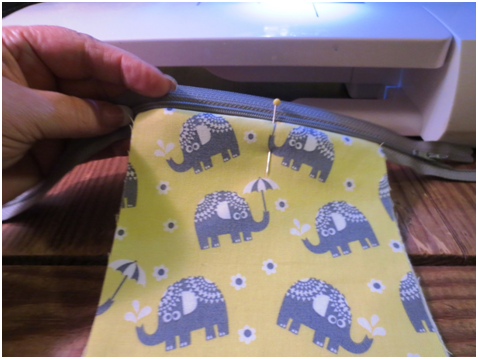 Flip your fabrics so that your outer fabric and lining fabric join wrong sides together and pin to your liking. 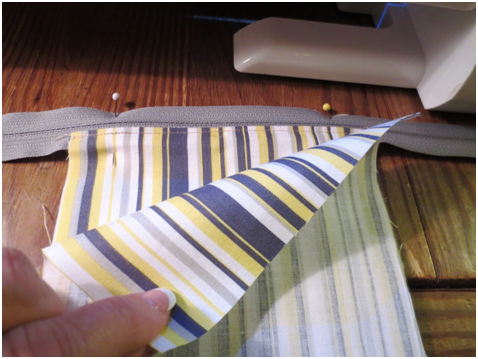 Sew a 1/8th inch seam to secure your fabrics to the zipper. This is what the lining fabric will look like after you flip it and pin. 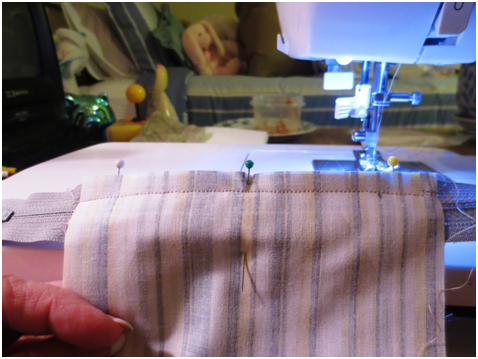 Sew the 1/8th inch seam. Here is what it will look like after you have sewed. 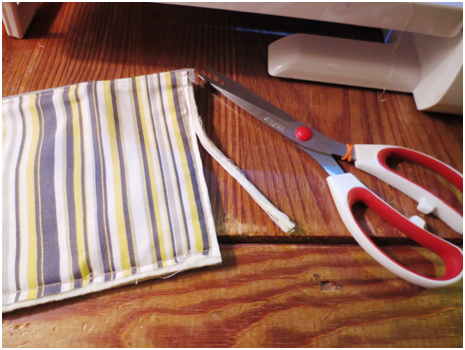 You will repeat these steps for the second side of the pouch and zipper. 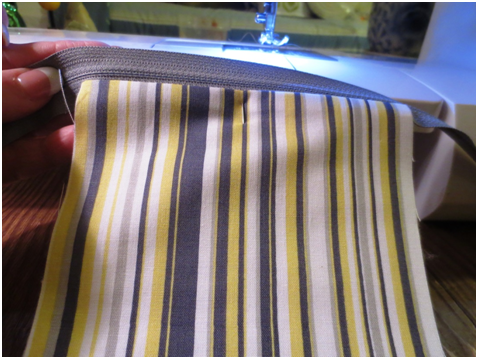 Place the outer fabric face up and align the zipper face down to the top edge. 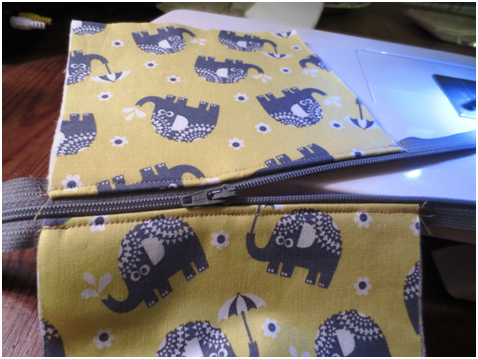 Pin the zipper to your liking and then place the lining fabric face down and pin again. 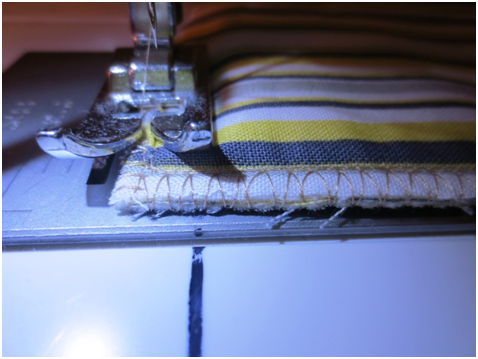 Sew the three layers together as close to the zipper teeth (or chain) as you can. You will have a seam that is slightly larger than a quarter of an inch. 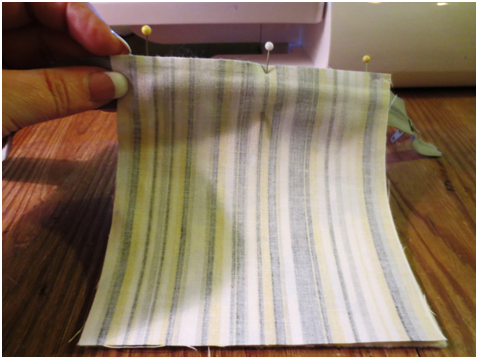 Again, you will flip the outer fabric and lining fabric so that wrong sides are together, pin to your liking, and sew a 1/8th inch seam to anchor the fabric to your zipper. 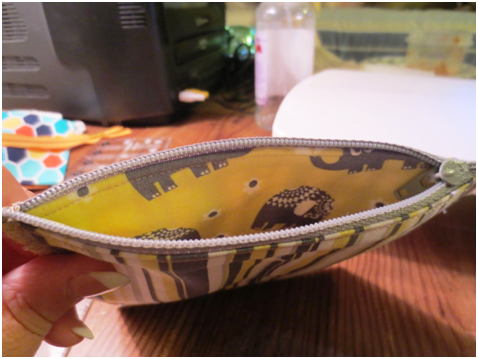 Sewing the 1/8th seam also gives the top of the pouch a clean, finished look. You are getting close to being finished now! This next step you don’t want to miss because if you do – you will have a lot of “unsewing” to do and you don’t want that. Take your zipper and open it up half way. 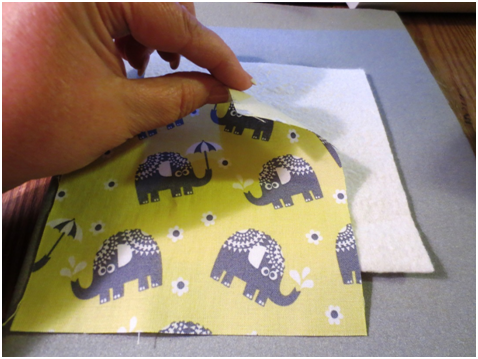 You will be folding the fabric so that the two outer fabric pieces are facing right sides together. 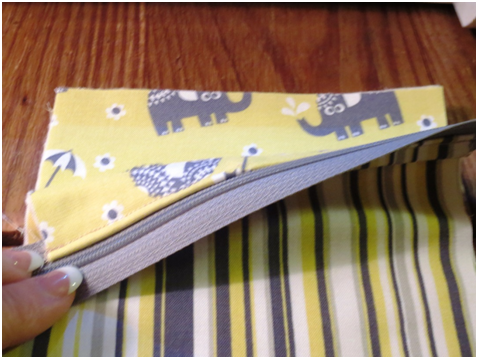 This will leave your lining fabric facing right side up – on both sides of the zipper. 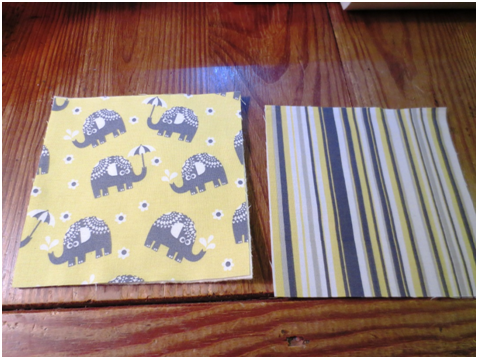 Pin the three sides to your liking, trying to match up the side and bottom seams as close as possible. 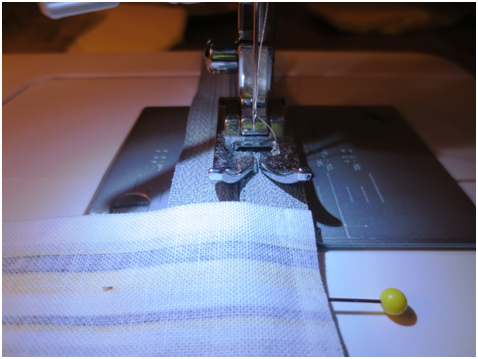 Sew a ¼” seam around the three sides. 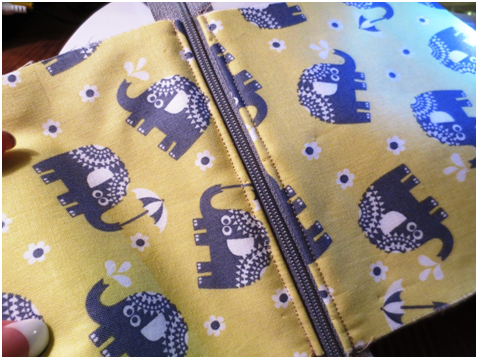 I actually started at the top where the zipper is and backstitched several times to secure the zipper. 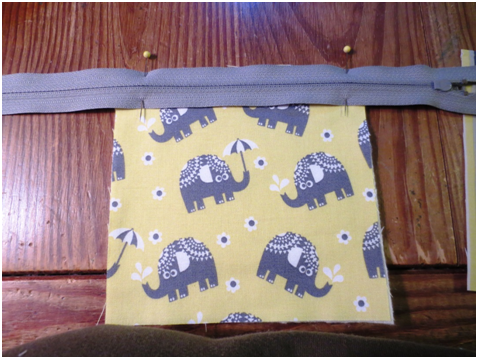 I also sewed the ¼” seam twice just to give the pouch some additional stitch security. 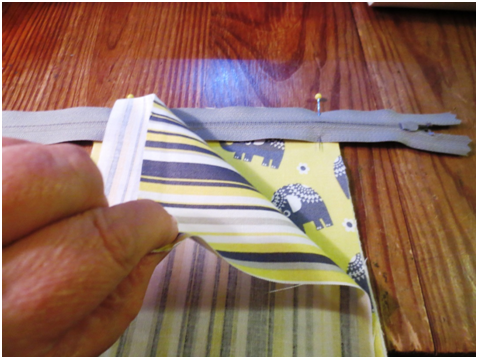 After you have sewn the three sides together, you will cut the excess zipper pieces on both sides off. 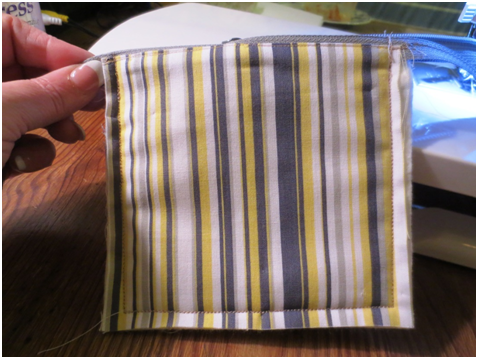 I wanted to take one additional step to secure the seams, so I trimmed to 1/8” inch and then sewed a zig zag stitch around the three sides. 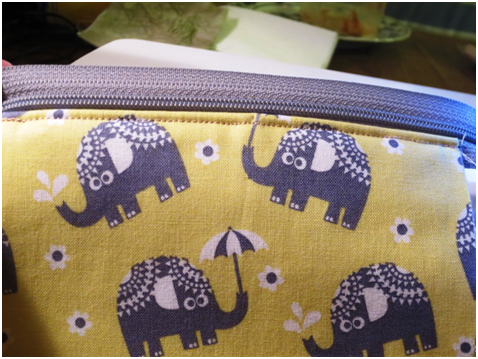 Now you can open up the zipper and turn the pouch inside out. 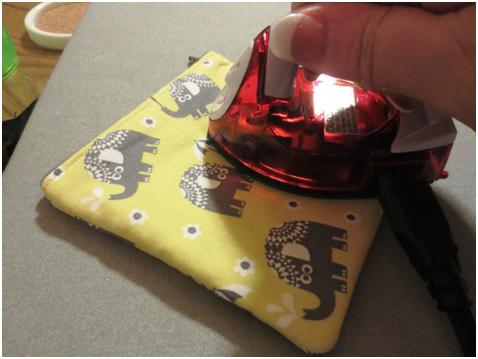 Iron your little pouch to flatten out the seams and any wrinkles in the fabric. And VOILA! Your new little pouch is ready to be used. You can get real creative and make quilted blocks and use those for your outer fabric, or take a page of an old telephone book or newsprint and cut to the size you like and string piece your outer fabric. 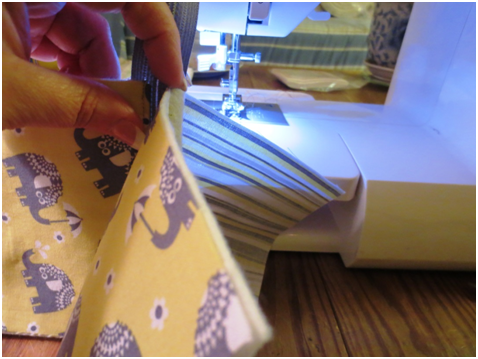 Let your imagination have fun and make multiples for your sewing bee, guild, family and friends. 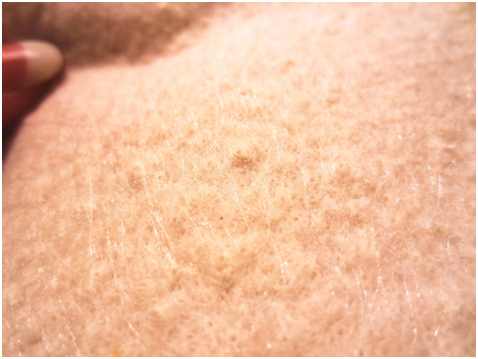 Dream Puff is 100% polyester batting that has been thermally bonded for a wonderful loft and warmth. It is lightweight and breathable, but has a high thermal value making it even warmer than down. 1/3-1/2” of loft to show off your quilting, designs “pop” out at you! Can be stitched closely and holds the drape, then pops out in less quilted areas for a faux trapunto look. 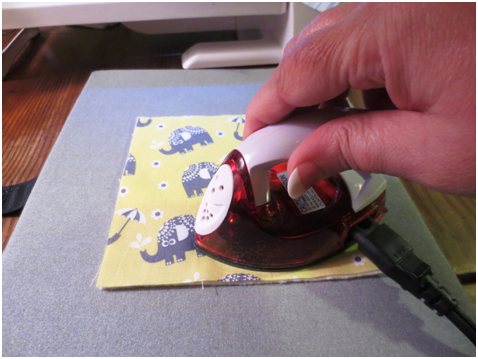 Although it is lofty, it flattens out for ease in hand quilting! Very long fibers – no lint on the machine or in the air! Thermally bonded, so it can become stiff it put into contact with heat (Even on low heat, the drum of some dryers become hot enough to cause a problem), so we recommend air drying or drying with no heat. Absolutely no ironing! Dream Wool is another warm and lofty batting that has been thermally bonded- it is one of my favorites for cozy snuggling on cold nights! The U.S. wool is scoured and super-washed for cleanliness and to eliminate shrinkage, then blended with low melt poly fibers for thermal bonding. Our unique processing creates wool batting that is light weight, machine washable, has very little shrinkage, and resists bearding. Very warm, yet light weight. Can be difficult to tell which side is fusible - so pay close attention to the sticker! All of our battings are proudly made in the USA, and each batting is hand cut and hand inspected to insure superb quality is consistency. 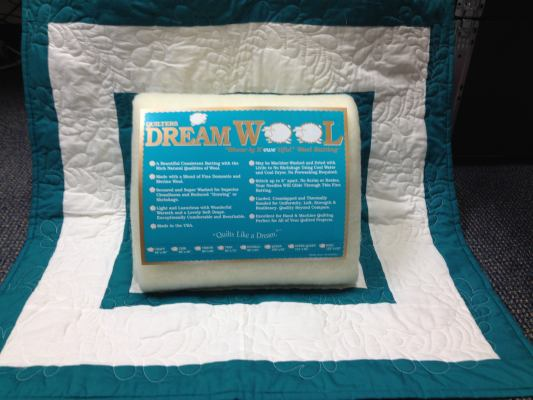 Quilters Dream is a small, family owned business, so we don’t sell to chain stores and always encourage our customers to support their locally owned quilt shop or quilting business! 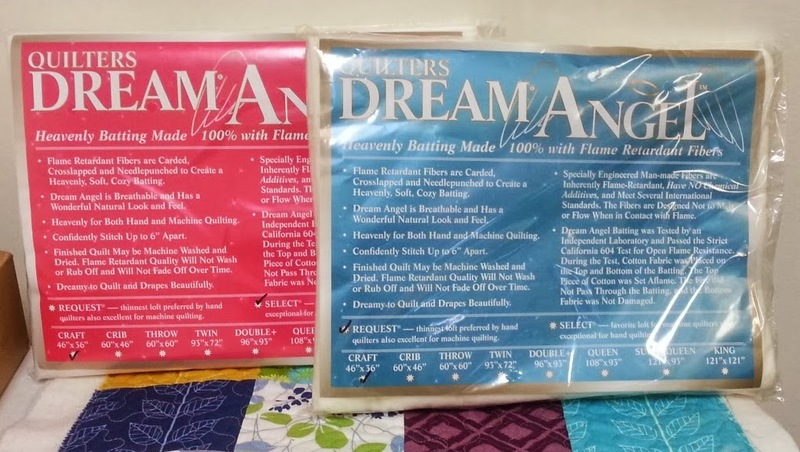 There are a lot of advantages to using Quilters Dream Batting, and with the wide variety of lofts, fibers, colors & sizes available, we hope that you find the choices to be to your advantage when choosing the perfect type of batting for your quilted treasure! 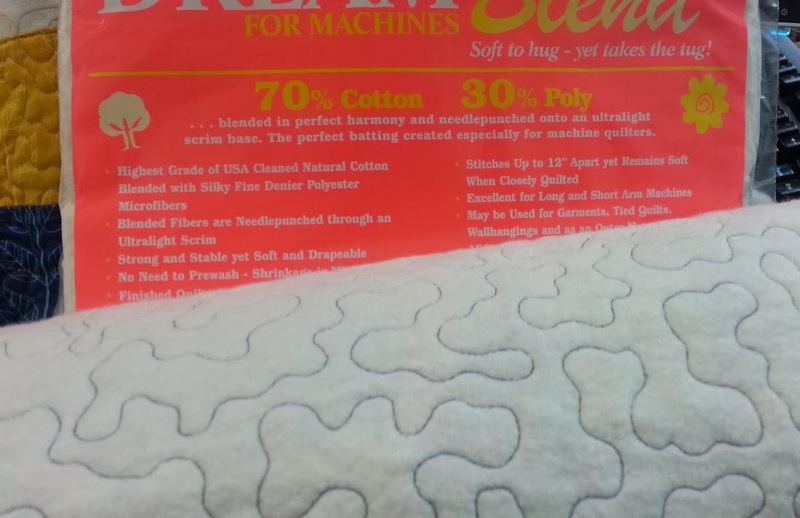 Quilters Dream Blend for Machines available in Select (mid-loft) quilts up beautifully! "Soft to hug, yet takes the tug!" Dream Blend is the only batting we make that has a scrim base (similar in look/feel to a cheesecloth) that adds stability for tugging, pulling, and general abuse. It consists of 70% cotton and 30% polyester that is needle punched through the ultra-light scrim base. 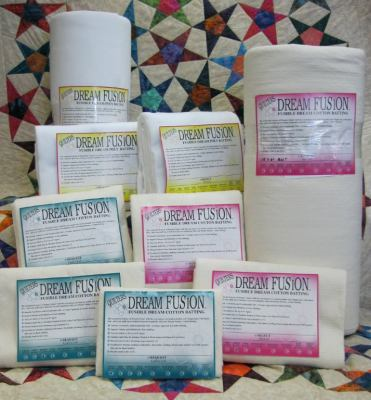 Dream Blend was developed for machine quilters who need more strength and stability, especially for use on the longarm machine. Quilters Dream Blend Batting with the reinforcing scrim layer peeled back from the batting. Can be stitched up to 12" apart! We used the lightest weight scrim available to it still has a nice drape and does not feel stiff. Very long fibers – no lint in your machine or in the air! Due to reinforcing scrim layer, Blend Is not recommended for hand quilting. Quilters Dream Angel Batting, available in Request (low-loft) and Select (mid-loft). 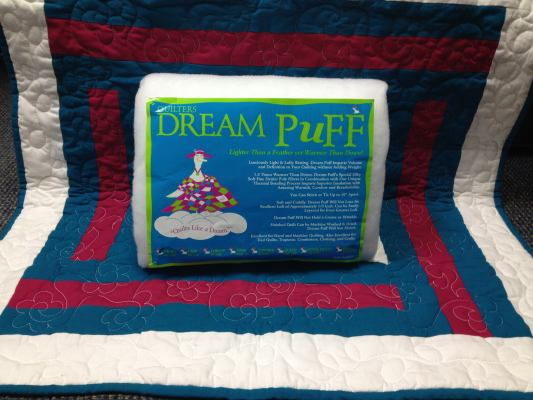 Dream Angel is heavenly because it is made 100% from flame retardant fibers. breathable batting with a natural look and feel. Please come back soon for part 4 of our Month Long Series: Batting University. We will continue with Dream Puff, Dream Wool, and Dream Fusion Battings!